How Did The "Jackets" Get Their Name? "During the late 30's, I furnished a column to the Valley Journal (local newspaper covering the Three Rivers area). This weekly entry entitled "Taylor Tattle" and later as "Taylor" published the school activities that were newsworthy. In 1937, the Boys HI-Y Club furnished warm-up jackets to the basketball team. As this regalia's outer shell consisted of bright yellow gold satin, I began using the title "Yellow Jackets" as the competitive moniker on my sports reports. After researching the Cincinnati newspapers, teachers, old grads and townspeople, I couldn't unearth any previous nickname that was formally utilized. With the blessing of school officials, I continued using "Yellow Jackets" in my column and campaigned for its use on school programs, advertisements and news items to the Cincinnati papers. I also promoted "the hive" for the sport arenas, but this did not generate interest as well. 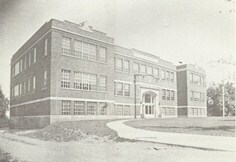 In recent years several alumni stated that the names Titans" and "Trojans" were used, briefly."